During the years of 1968-1977 Germany lived in fear. Three terrorist groups - the Red Army Faction (RAF), Movement 2 June, and the Revolutionary Cells (RZ) - gathered about a hundred Germans as their members. The Baader-Meinhof Gang, who called themselves the Red Army Faction, and two other terrorist groups went killing dozens of people. In 1968 the prominent German journalist Ulrike Meinhof joined the former juvenile delinquent Andreas Baader and his girlfriend Gudrun Ensslin in launching the most terrifying era in German postwar history. The student protests of 1968 gradually became riots. The young terrorists in their desperate attempt to start the world revolution took to terrorism: mere bank robbings turned to kidnappings and murders. 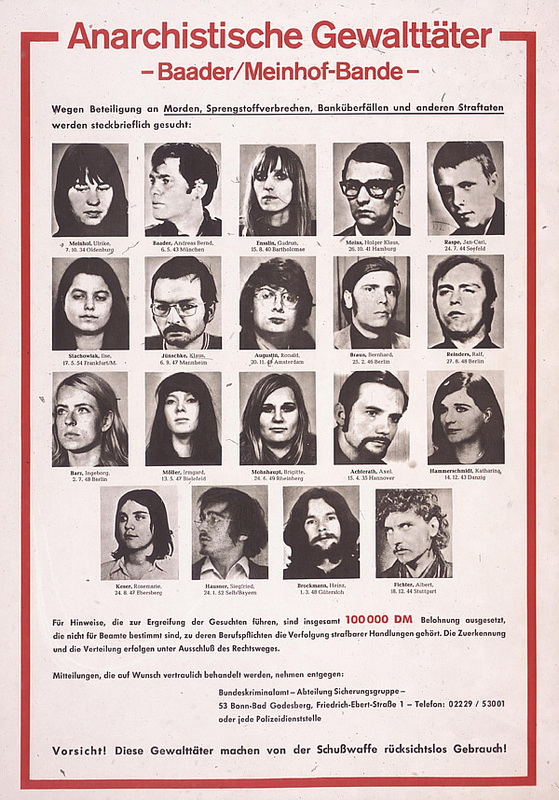 Most of the leaders of the most famous West German terrorist group, the Baader-Meinhof Gang, were captured in mid-1972. Their followers continued kidnapping and killing people over the next five years in an effort to secure their leaders' release from prison, but it was all in vain. The German government had no intention of releasing them. The German government used the terrorist crisis to approve new laws giving them broad powers in fighting terrorism. Radical leftists protested, but the majority of the German people were firmly on the side of the government. Late in 1977, after an airplane hi-jacking by Palestinian comrades failed to release the three imprisoned leaders of the Baader-Meinhof Gang, the terrorists Andreas Baader, Gudrun Ensslin, and Jan-Carl Raspe all committed suicide at Stammheim prison deep at night on October 17, 1977. The Baader-Meinhof era, the era of "German Autumn", was over. Everybody in Germany hoped so. Unfortunately many kidnappings and deaths were yet to come. Only in April of 1998, a communiqué sent to Reuters proved what many had long suspected: that the RAF was officially disbanded.